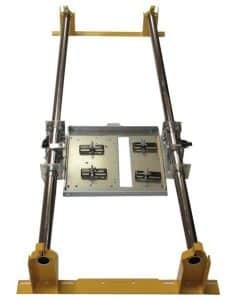 All Saw Trax panel saws come standard with the Accu-Square Alignment system, Sealed Steel Roller Bearings, Powder Coated Steel Frame, Saw Cord Holder, 2 Carriage Locks, Support Strip Bracket and 11 gauge Steel Guide Tubes. The Varsity uses a compact 5 ft. wide frame. 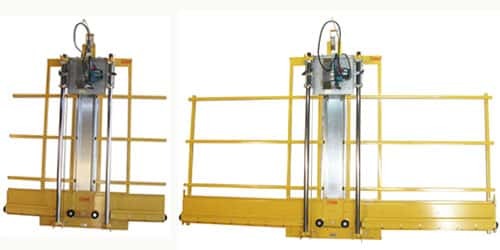 The 1000 Series uses a 10 ft. wide frame. These are used for medium duty cutting requirements. 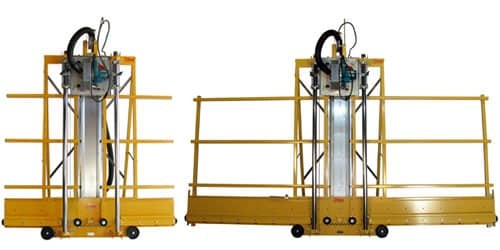 They have the same features building on the equipment on the Classic series adding a dust port, dust hose, dust blade brush, folding stand, frame wheels, stop/bar and dual rip gauges. Full Size 52, 64, 76,88 and 100 inch cross cuts. The Sign Maker’s series is used by shops needing a clean and sturdy cutter that stays square. 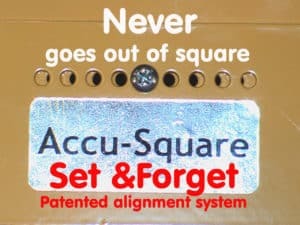 It adds on to the Varsity and 1000 Series by adding a spring hold down system and a pivoting razor knife that is spring loaded and cuts vertically and horizontally. These are used for heavy duty cutting requirements or if you have gorillas working in the shop. The 2000 Series adds to the 1000 series but uses a Makita 5377NB hypoid saw and uses steel sleeves over the plastic rollers. The hypoid is a maintenance free version of the worm drive saw without the need for oil changes. Full Size 52, 64 and 76 inch cross cuts. These are used for heavy duty cutting requirements or if you need the deep cut or precision of 10 inch saw blades. The 3000 Series adds to the 1000 series but uses a 10″ Milwaukee saw and uses steel sleeves over the plastic rollers. The hypoid is a maintenance free version of the worm drive saw without the need for oil changes. The Classic Panel Saw adds the Makita 5007F saw along with a horizontal and vertical tape for fast alignment, rip gauge pointer, blade guard, trigger lock, spinning insert plate, saw cover with viewing port and a 24 tooth Carbide saw blade. 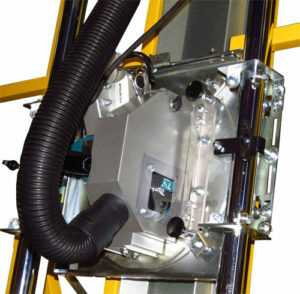 The Basic Series is a panel saw without the saw, so you can use the saw you already own. By using your own saw, you would be saving money. This way, you can also add the options and upgrades available with all the Saw Trax panel saws. 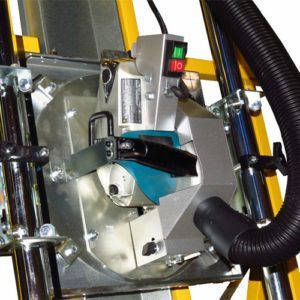 Includes the Standard Equipment plus Universal Saw Plate with hold downs. 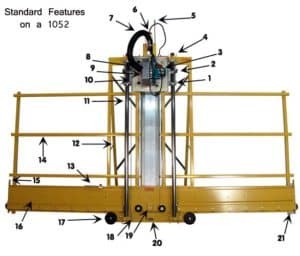 This is the heart and soul of any panel saw, the tracking mechanism that transports the saw. 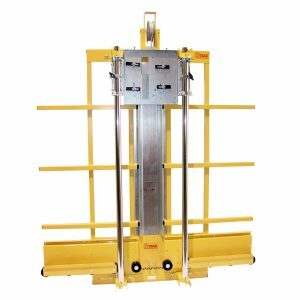 It includes the carriage that uses 12 sealed bearings, 11 gauge steel guide tubes and the brackets we use to mount them our panel saw frames. 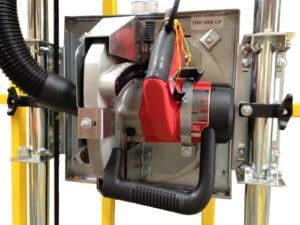 If you want to save money but have the precision of our panel saws or have the option of simply mounting the kit horizontally to a table for job site flexibility, this would be your choice. Our Beam Saw kit is designed to use the Makita 5402NA 16 inch saw blades that very expensive beam saws use. It uses thicker walled 1/4″ tubes and has an optional dust collection package. It is designed to cross cut over 46 inches with a 6 inch depth of cut. This is a great alternative for cutting counter top splash guards. 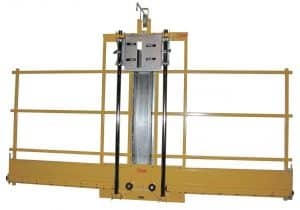 Making the investment in a vertical panel saw is not cheap. 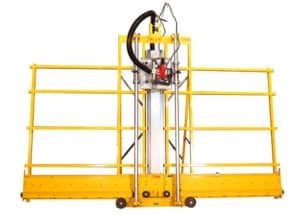 To learn more about the Saw Trax Features or why our machines are more accurate and easier to use, click on the links below. 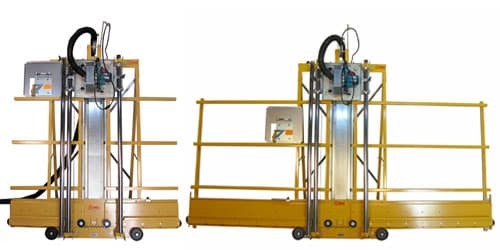 Click here for the Features and Benefits of a Saw Trax. An educated person is our best customer! 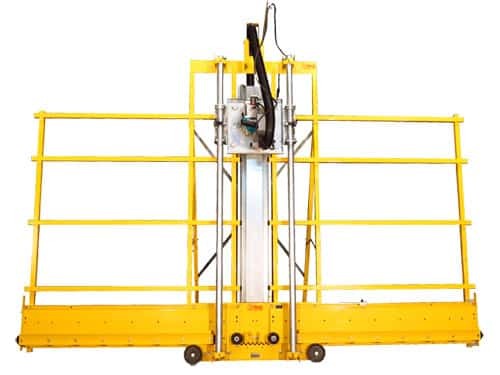 See why a Saw Trax is the most accurate and easiest to use Vertical Panel Saw.